Martha A. Wade is an award winning visual artist from Chicago who has always carried a deep passion for art making. Her painting style utilizes whimsical themes of fantasy and hope, to portray cultural and historical themes in a positive tone. Her artwork has a dreamlike feel, as Martha works to create a sense of movement in every piece. You will often find star constellations hidden in Martha’s work – her way of visualizing that we are all made of stardust. Her art seeks to uplift spirits by giving a glimpse of what people can achieve at our highest potential. Her tapestry of everyday people with rustic elements of fantasy suggest that common ground exists, where everyone is empowered to fulfill their dreams. Martha’s work often has a dual theme, as in her series of children with spirit animals of Childhood Dreams & Conquered Fears. The message speaks to the strength of children who are often fearless, and at the same time encourages us to hold on to our innocence. Her latest body of work Sirens deals with the blessings and stigma of being a powerful woman, often seen as intimidating and alluring by others. Martha learned to create at the foot of her artist father Eugene “Eda” Wade, who she watched and admired as a young girl longing for a canvas of her own. She has gone on to create over 200 paintings on wood and canvas. Her work can be found in private homes and collections around the world. She is a board member of the South Side Community Arts Center, and striving to empower younger generations to get involved in the arts. 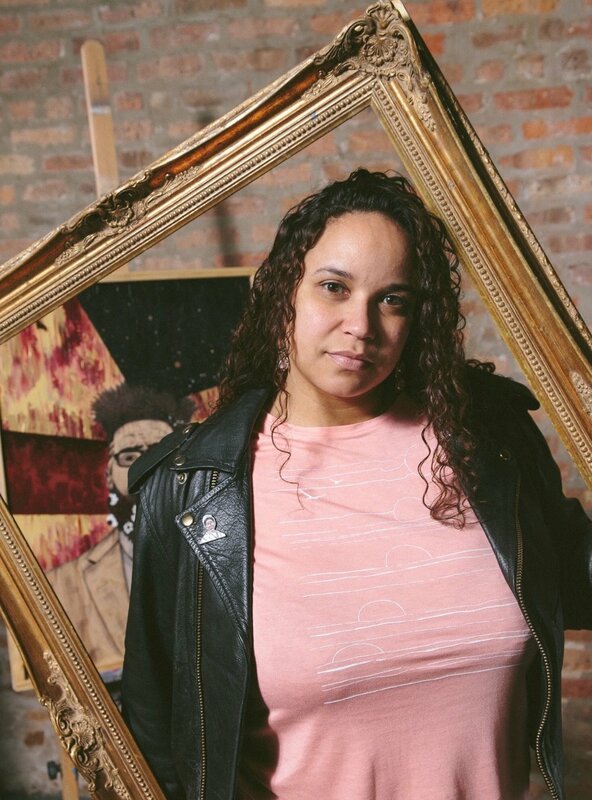 As a member of the Board of the South Side Community Art Center, she strives to empower younger generations to get involved in the arts. Martha is co-owner of Galleryna19 in the Oak Park Arts District. Galleryna19 is a fine art gallery dedicated to showcasing the works of emerging, and mid-career artists to align multiple cultures and provide a venue where artists come together to create and collaborate. the artist in studio working on her “Sirens” painting.